The 48th Annual Eclipse Awards, presented by Daily Racing Form, Breeders' Cup and The Stronach Group, will air live on TVG, the National Thoroughbred Racing Association (NTRA) has announced. Hosted by Jeannine Edwards and highlighted by the announcement of the 2018 Horse of the Year, the Eclipse Awards ceremony will be held on Thursday, Jan. 24, at 8 p.m. ET in the Sport of Kings Theatre at Gulfstream Park Racing and Casino in Hallandale Beach, Fla.
Tickets to The Eclipse Awards ceremony are on sale for $425 each or $4,000 for a table of 10. For reservations, please contact Casey Hamilton of the NTRA at [email protected], or call (859) 422-2627. 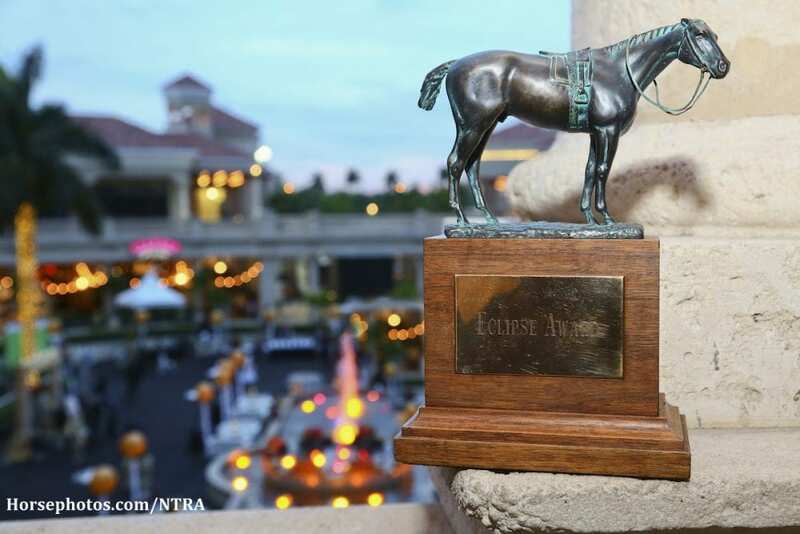 For more information on The Eclipse Awards, visit ntra.com/eclipse-awards. This entry was posted in The Biz and tagged Breeders' Cup, chris littlemore, daily racing form, eclipse award of merit, eclipse awards, gulfstream park, joe harper, National Thoroughbred Racing Association, National turf writers and broadcasters, ntra moment of the year, The Stronach Group by Press Release. Bookmark the permalink.